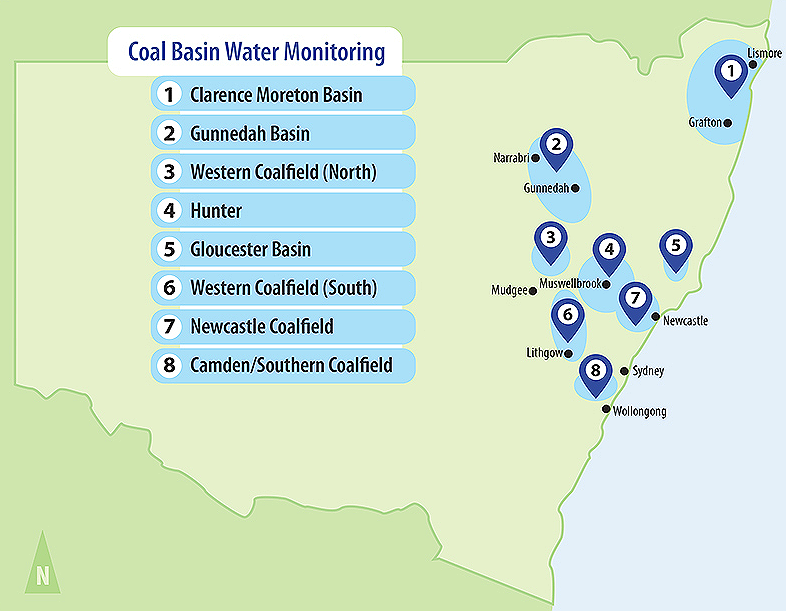 The Water Monitoring Strategy for Coal Basins in NSW has been developed to improve the department's understanding of groundwater behaviour in the NSW coal-bearing geological basins. The strategy aims to collect monitoring data for groundwater and surface water in coal basins, and to understand the potential effects of extractive industries on water resources in these locations. As part of the strategy, we are expanding the existing network of water monitoring infrastructure. This initiative will improve our knowledge of groundwater behaviour across NSW’s coal basins through the provision of better mapping, monitoring and management. When complete, the data from the water monitoring sites will be shared with the community, government and industry, delivering a long-term benefit for multiple data users. A total of $22.8 million has been allocated by the NSW Government to deliver the strategy, which is expected to be completed by 2020. Why expand the network of water monitoring locations? What work is required to create new water monitoring points? Between 50-90 new deep water monitoring bores will be constructed in coal basins in NSW. See the map above for the selected locations of monitoring. Monitoring points will be placed in both shallow and deep aquifers, measuring groundwater quality, level and pressure. Through a rigorous selection process, the department determines proposed bore sites. This process involves a combination of scientific data and a peer review. The proposed sites allow for accurate measurement of groundwater quality and changes over time. A fact sheet ((PDF 283.0 KB)) has been developed which contains further information on water monitoring, including site selection and equipment used. The data obtained from the monitoring points will be collated and managed within the department's corporate water data systems. The data and derived information products will be available to all users through the internet. Some data will be available in real-time directly from a live feed from the water monitoring points. The data will be used by the Government to analyse any changes to water quality and quantity. This information is not used for regulating nearby water use. Southern Coalfields (Camden to Moss Vale) - construction of the first round of water bore drilling began in July 2018, with expected completion toward the end of 2018. A second round of construction will start in late 2018. Hunter Coalfields – site selection and preparatory work has concluded, with water bore drilling expected to commence in November/December 2018. Gunnedah Basin – sites are selected and drilling is planned for early 2019. Western Coalfield (North and South) – land access and environmental approval work will commence in late 2018 with drilling planned for 2019. For more information, a fact sheet ((PDF 281.8 KB)) on the rollout and planned activities has been developed for the southern coalfields. Alternatively check back in on this web page, which will be regularly updated as the water monitoring network expansion is rolled out across each area.